Why stay in a run-of-the-mill Hampton Inn when you could sleep in an upside tree, stay in a hotel that’s made entirely of ice or be checked in by a velociraptor receptionist? Here are the top five weirdest hotels in the world for when you want to take a vacation on the wild side. If you’ve ever wished you could live out your Frozen dreams, here’s your chance to enjoy a night in your very own ice castle. Located in Quebec City, this structure is the only ice hotel in North America and is made of 30,000 tons of snow and 500 tons of ice. Warm up in one of its heated bathrooms, outdoor saunas or with a cocktail served in a glass made of ice. 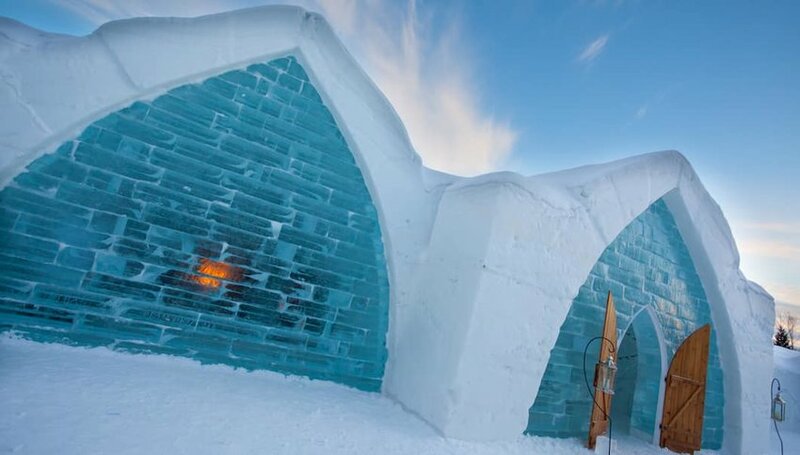 The hotel also features a chapel, an ice slide and an Ice Bar. Spend a night in one of its themed suites, but book fast — the hotel is only open for three months out of the year (January through March). If you like a healthy dose of creepiness, this is the hotel for you. In a bid for efficiency, Henna-na Hotel in Huis Ten Bosch Theme Park (Nagasaki) is staffed by robots that speak both Japanese and English. 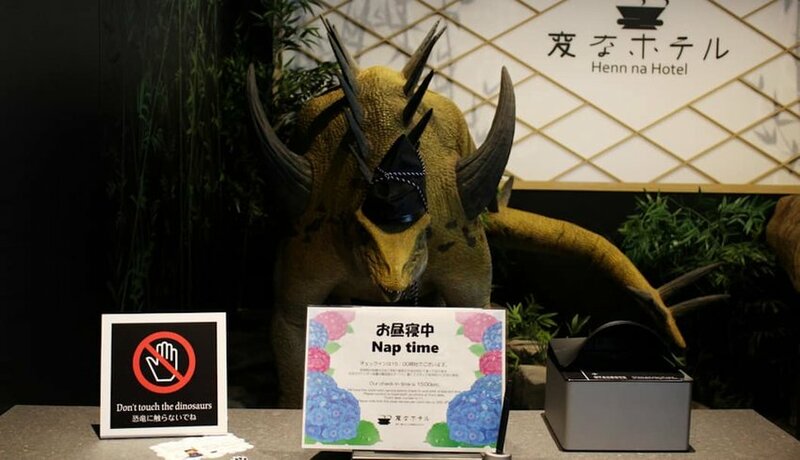 Check in with a giant robot dinosaur at reception, and be led to your room by robot porters. Efficient? Maybe. More than a little creepy? Definitely — especially when you consider that one robot is a velociraptor and another is a giant mechanical arm. When most people think of Austria, they envision green mountains, lavish cities and snowy mountains dotted with tiny villages. 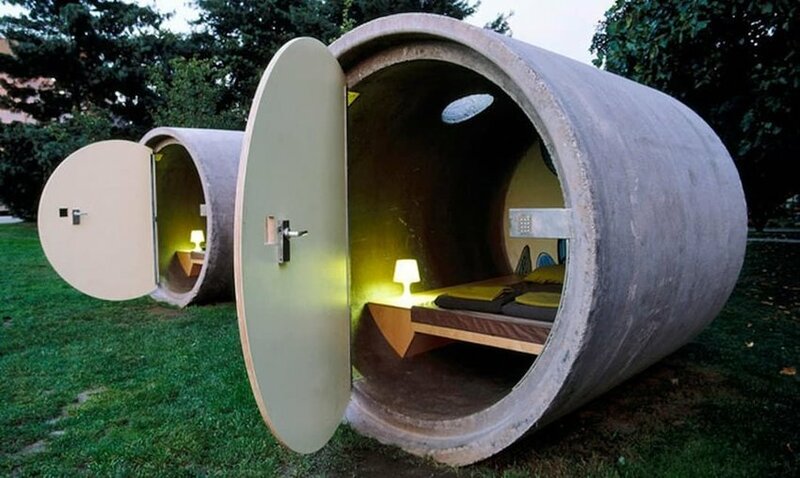 But in Ottensheim, Austria, you have the opportunity to stay in a refurbished sewage pipe. Called “unique” and “thoughtful” by Atlas Obscura, this hotel gives sewage pipes — which would have otherwise languished in landfills — a new purpose. The hotel has multiple individual rooms, each one a separate pod with a double bed, skylight and power outlet. The only thing they don’t have is a bathroom. They’re small but cozy, and they’re also green-friendly, sustainable and cheap. 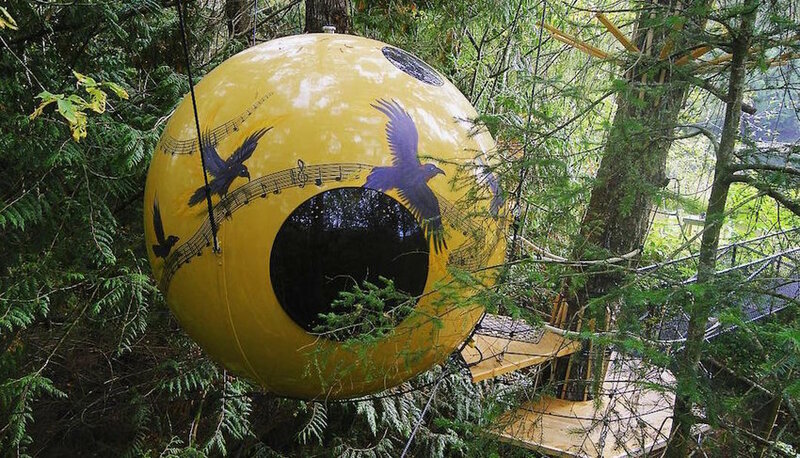 These pods suspended from the trees look like something out of the Amazon rainforest, but actually, you can sleep in these orbs in Vancouver Island, British Columbia. The spheres dangle from the trees 10 to 15 feet off the ground; they’re made of wood with flat floors, and each sphere has electricity and a comfortable bed. But watch your step: although they’re very safe, the spheres do sway side to side when you move. There are many things to do nearby the Free Spirit Spheres, such as ziplining, kayaking and visiting a salmon hatchery. In the middle of the forest stands a structure that resembles an upside down tree, set on stilts with hotel rooms embedded like pine cones into the side. 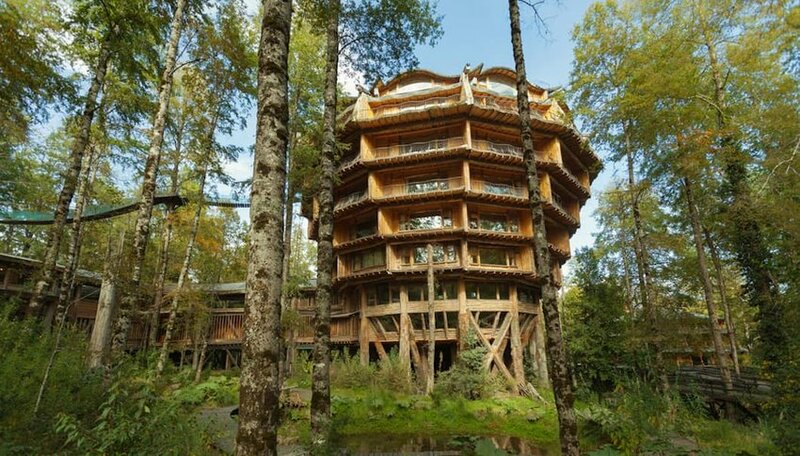 This magnificent lodge located on the property of Huilo Huilo Biological Reserve (in the southern Andes) is straight out of a fantasy movie, but it’s also very comfortable. Inside, the hotel is cozy and rustic, featuring two-story suites with jacuzzi tubs and spectacular views of the surrounding forest. The rooftop viewing platform allows for stunning vistas of the nearby volcano and the absolute silence that comes with being part of nature. and Huilo Huilo has other unique hotels on the property as well (check out the magic mountain hotel which comes complete with its own waterfall).